Claygate Pearmain was discovered in the early 19th century growing near the village of Claygate in Surrey, by apple enthusiast John Braddick. 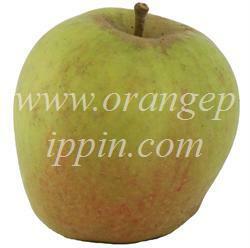 It soon became a popular apple variety, widely-grown in English gardens. The flesh is fairly soft, quite juicy, with a rich aromatic flavour. 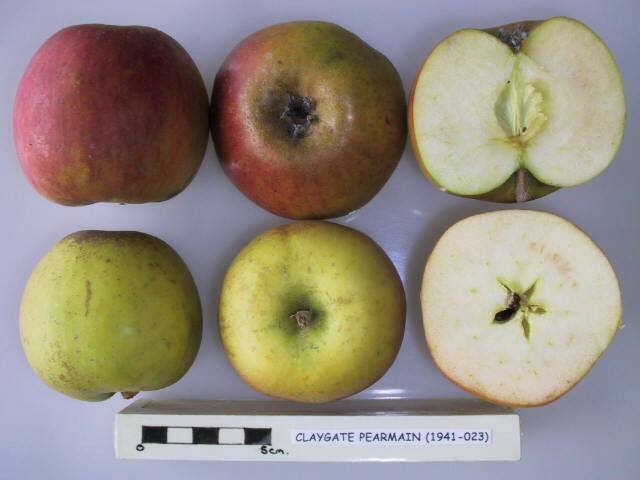 Claygate Pearmain keeps fairly well, the colour changing to yellow in storage. Delicious apple. Quite tart right off the tree, somewhat like a Granny Smith, but more complex. Sweetens and intensifies in storage. Tree is resistant to scab and easy to grow. Wide crotch angles give it a nice shape without a lot of pruning. Susceptible to bitter pit. Apples tend to start dropping as they ripen. Here in Michigan it ripens about a week after MacIntosh. My Claygate Permain, purchased 7 years ago from Tooley's Trees in Truchas, New Mexico, has finally had a nice fruit set this year. I've thinned and bagged the apples and they look very healthy. We'll see how our turbulent summer weather treats them. After a month in cold storage, the tropical fruit flavour develops into one of the most deliciously complex apples I've ever tasted. I would rank this in my top five desert varieties. A shame it is not widely grown in USA. A very superior apple. Flavour is incredibly complex if picked when ripe and stored for a week or two. There are definite pineapple notes on offer. So far, this is the best apple I have ever tasted. The Claygate Pearmain is suitable to Pot, or Wine Barrel, application, according to The Martin Crawford "Directory of Apple Cultivars". Braddick's Nonpareil - Braddick's Nonpareil and Claygate Pearmain were both discovered by John Braddick.